Video conferencing is mainly associated with corporate boardrooms and offices trying to boost productivity and is not often though of for house of worship. But as churches become more comfortable with technology, many are starting to see the advantages of using professional conferencing technology in their ministries. Churches all over the country are using live streaming services to extend their reach and create lasting content. This same type of video technology can be used to bring people closer together in an even more personal way with video conferencing. For whatever reason your church is looking into video conferencing technology from community outreach, internal meetings, or beyond, you might want to consider upgrading from your computer camera and mic to something more professional. We have put together this simple guide to offer a few affordable but quality conferencing kits so that any size church can look and sound great conferencing today! Any conferencing solution requires 4 main components (see our handy guide here): a camera, audio, display, and a computer. Each of our kitted solutions offers these components with different capabilities depending on your room size and use case. All of our solutions are designed for a user friendly experience and are compatible with most if not all of your favorite conferencing software like Zoom, GoToMeeting, Skype, and more. Plus when you purchase a kit from CRS you can expect responsive and high quality customer service and support all day, everyday. Already have one or more of these components? No problem, all of our solutions can be sold a la carte, but each offers a great guide for what you would need for a fully functioning professional video conferencing set up. Let’s start small with an all in one professional camera and speakerphone. The HuddlecamGO is an incredible little device that retails for only $299. Not tech savvy? Not to worry as this camera only needs to be connected with one USB cable directly to your computer. This plug and play solution makes it affordable and easy for any church to get started conferencing with little to no tech knowledge. The camera has a super wide field of view (110 degrees) which allows users to fit a whole lot into one frame, think a wide room or multiple people. On the go? This camera is small and great for people who needs to stay connected while travelling. The microphone is omnidirectional so it will clearly pick up audio from anywhere in the room, alleviating the need to actually “huddle” around the device. The microphone also comes with echo and noise cancellation so you will always sound crystal clear. The only accessories you need in addition to this camera are your existing computer, display, and the free version of your favorite conferencing software. The HuddleCamHD 3X-G2 is the perfect entry-level conferencing camera for churches with small to medium sized rooms offering a superior quality at an unbeatable price! When paired with the HuddlePod Air, our wireless USB PC speakerphone, your conference will be set up for success with professional looking video and clear audio. All you need to complete this package is a display system and computer. Designed to be user friendly, churches of any size, shape, and tech ability will be able to install and use this camera without the help of an AV team. The pan, tilt, and zoom of this camera can be controlled by the included remote, a joystick, or even an IOS app on your cell phone. Churches can use this camera for conferencing or live streaming, and the crystal clear audio pod can even be used for podcasting another great way to reach your churches audience. 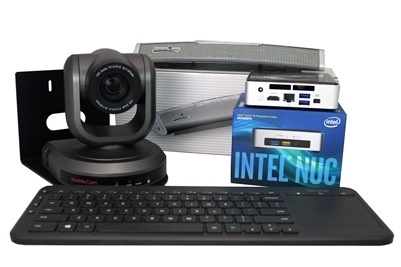 The HuddleCamHD team video conferencing solution is an easy to install kit designed for video conferencing, live streaming, webinars and more. This solution is specifically designed for simplicity and a user friendly experience great for house of worship. All the products in this kit feature plug-and-play technology, making it extremely easy to set up. 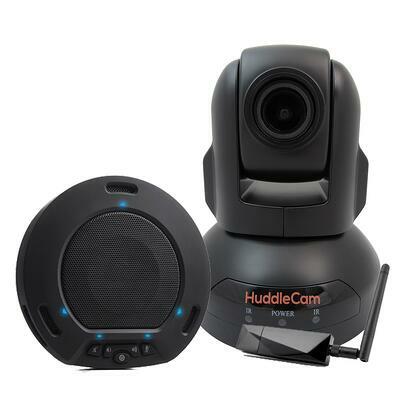 The HuddleCamHD 3X-G2 & HuddlePod Air are both highly compatible hardware options giving you the ability to use your favorite video software like zoom, skype, bluejeans, and more. 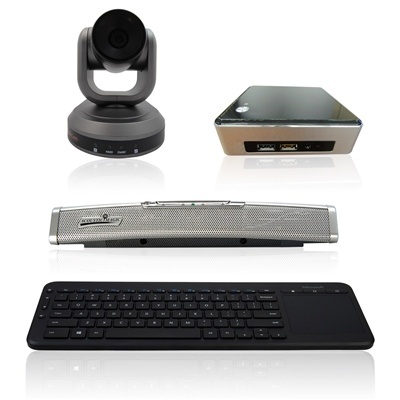 Included in this kit is also a dedicated PC, so you do not have to rely on anyone bringing a laptop to your meeting. This high powered computer can also support multiple cameras if and when you are ready to upgrade. This kit also comes with Quicklaunch a software that makes it quick and easy to launch your favorite conferencing apps like zoom, skype, etc. Lastly this option includes a Microsoft all-in-one wireless keyboard for seamless and easy control. Unlike the two aforementioned options that included just and camera and microphone, this kit comes with every accessory you need to have a top quality video conference set up. Get your church looking and sounding great easily with this kit. Need a wide angle camera to capture a wide room or a large group of people and don’t want anything on your conference table? This is the solution for your church. 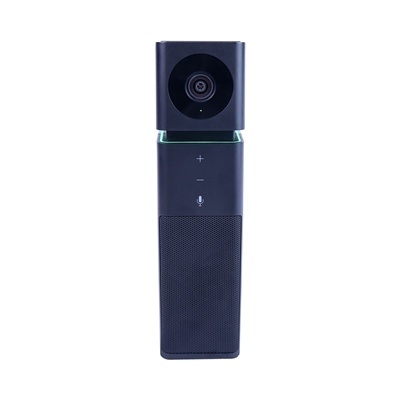 The 3XW camera has a 90 degree FOV giving you the ability to capture wall to wall and everything in between in full HD uncompressed 1080p and the Voice Tracker is easily mounted to the wall and offers you up to 20 ft range from the unit. With the camera, speakerphone, and computer all mounted on the wall all you need is the wireless keyboard for control on your conference table. This kit leaves your conference room clutter-free and ready to go whenever you are for productive meetings. An all-in-one kit that offers everything you need to get started, this kit is easy to install and use for any church. 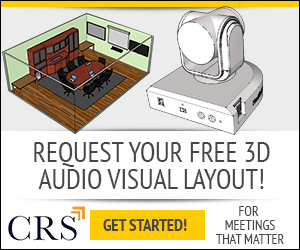 The Large VCS Conference System is a custom-built solution specifically designed around medium to large rooms where a high quality camera & multiple microphones may be needed. The PTZOptics 12X-USB has a 72.5° FOV & 12X optical zoom giving you the ability to pan, tilt, and zoom to the position needed in full uncompressed 1080p. The Smart Spider can be easily powered through PoE with the MT340 making setup even easier. Once powered with the MT340 you can daisy chain numerous Smart Spiders together. We've included the MT334 ceiling mount in case you're in need of mounting the Smart Spider above your conference table. The equipment we've chosen are highly compatible with most if not all video conference software, so you can choose from your favorites such as GotoMeeting, Blue Jeans, Adobe Connect, and many more. Still not sure which kitted conference solution is best for your church? Reach out to one of our dedicated account managers here to get a custom design and quote for your room today or try our room design tool here.